The Aelisha race is the largest, most wide spread race in VayneLine. Their appearance is that of a fox-like humanoid, bipedal, and looking similar to Solarians except for a large tail and ears. The Aelisha are undisputed militarily and have many races under their protectorate including the Solarians. Their major strengths include an extremely advanced empathy and group harmony within their race; they are extremely martial/tribal with a long history of victorious conflict; are very religious preferring non-violence but ready to react viciously; and unrivaled technology. Aelisha are taller than Solarians and have a lithe body, they look very humanoid in a universe with only a fraction of humanoid species. 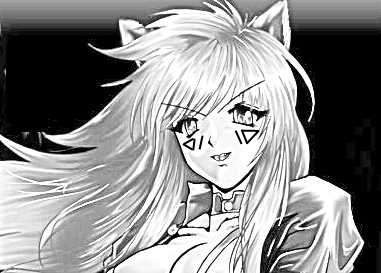 They could briefly be described as Japanese Kitsune or ‘fox girls’, and have large ears and a fluffy tail that without these two major distinctions on passing glance would not look much different than a Solarian. Given a heavy engineering to their lives (which the Aelisha Genetic Engineering the Solarians receive is based on) their appearance is very attractive even to other races if they have humanoid leanings in their preference. Aelisha have three digits and a thumb equivalent on each hand, meaning eight total digits which lead to their base-8 number system. In the 21st century of the Solarians (then ‘Human’) had come very close to extinction. A multitude of environmental devastation, a lack of energy resources, financial meltdown, and small scale nuclear exchanges were rapidly dragging the race towards extinction – the Sky Riots. The Aelisha had been watching the humans for a long time, and at this point stepped into save the planet at it was biologically diverse as well as due to Line Artifacts being detected within the planet. The first Aelisha dispatched was a scout named Rika who played a large role in the eventual provisional government that was established along with the human ‘Lei’ (real name unknown). With the Aelisha fleets arriving, the armed conflict was put to a rapid end on Terra (then ‘Earth’) and the severely reduced population was grateful for the alien assistance. The Aelisha gave them technology, notably nanite technology and eventual genetic engineering. It was a huge boon for the planet-locked species and they were granted space travel and soon took to the stars in huge numbers. In exchange the Solarians now had to serve the Aelisha in a military capacity, and represented a sort of ‘3rd world shock troops’ of which Solarian historians may find ironic that was done to some members of the race by their own race, was now done to the race as a whole by outsiders. In general the Aelisha act in an egalitarian way that might shock some Solarians, but there is little doubt of the degree of power between the two. In general, the attitude is closest perhaps to that of a parent and a child. Strives are the facial markings on the cheeks of Aelisha. This is a very important part of their culture. Aelisha are given a mirror image Strive on each cheek that is an actual tattoo/scarring into the bone that is permanent barring surgery. They are based on ancient Aelisha language which is a system of pictograms based heavily on geometric shapes. The Strive is a lesson or virtue that they are supposed to embody for their life. The system can be complicated, but in general there are simple particle parts that most can have a understanding of the message. An example is a single line or slash depending on orientation often means ‘path’ or ‘way’; a forward slash ( / ) would have a meaning more towards ‘staying the path’; whereas a backslash ( \ ) would mean more towards ‘looking or seeking the path’. A vertical line ( | ) would typically represent a ‘balanced path between extremes’ and a horizontal line ( – ) would represent a ‘completed path’. Between their two sexes, the root of the Strive often differs. Males typically have boxy/square  symbols which represent ‘strength’, ‘will’ and similar traits. Triangles are often used for females. Triangles are also particularly important, and depending on the orientation, size and direction mean different things but often ‘harmony’, ‘organization’, ‘group’, ‘understanding’. So the above picture, her Strive could be loosely read as ‘Seeking the path of harmony’. Variations of this are extremely popular given Aelishan diplomatic and empathetic nature. Strives are actually historic references to a long battle the Aelisha had with an very strong indigenous species on their planet before they became the dominate life form. They were a medium sized crustaceans the size of a Terran dog, that were powerful and could jump. Their primary way of killing was aiming at the face and latching on while cutting and clawing. Warriors who survived had severe facial scars and this was seen as a badge of honor that they had been attacked but had successfully fought the creature off. Due to the prevalence of the creature, it was common that even non-warriors would come into contact with small ones which could just as easily cause scarring. This formed the early bias of a martial society in that those lacking facial scars were viewed with disdain as ‘not experienced’ or ‘not doing their share’. The Strives are forced onto the members of the Aelisha protectorate, but in modified capacity. For the Solarians it is only on the left cheek, and unlike the Aelisha version which is deeper into the bone and a much more a ‘scar’, it is the equivalent of a more permanent tattoo on the face. All people who are AGEd receive a Strive, whereas people who are born do not, and is one of the easiest ways to delineate between the two. Many people who are born later chose to get a Strive, especially if they plan on living in Affiliated space. See the Strive section for more of a general focus from the Solarian perspective on the Strive system. Notably, the only AGEd members that do not have Strives are Star Priestesses. This is another historical reference because the Oracle class which was the historical precursor, was very important to early Aelisha society. Oracles exhibited very strong Psionics and had true precognition which actually caused many of them to remain un-scarred despite accompanying units into battle. This had the drastic effect of both given the Oracles a mystical feel, as well as excusing them as the one of the few that it was okay to lack any sign of combat with the native creature. The base-8 system figures prominently into the Rank system, as 64 is the highest a single crime can get. The Aelisha have far more ‘females’ than ‘males’ and outnumber then by a typical eight to one. Despite Solarians who within Affiliated space are almost always AGEd, Aelishas still have approximately 10-15% of births ‘naturally’. This section will be expanded later.